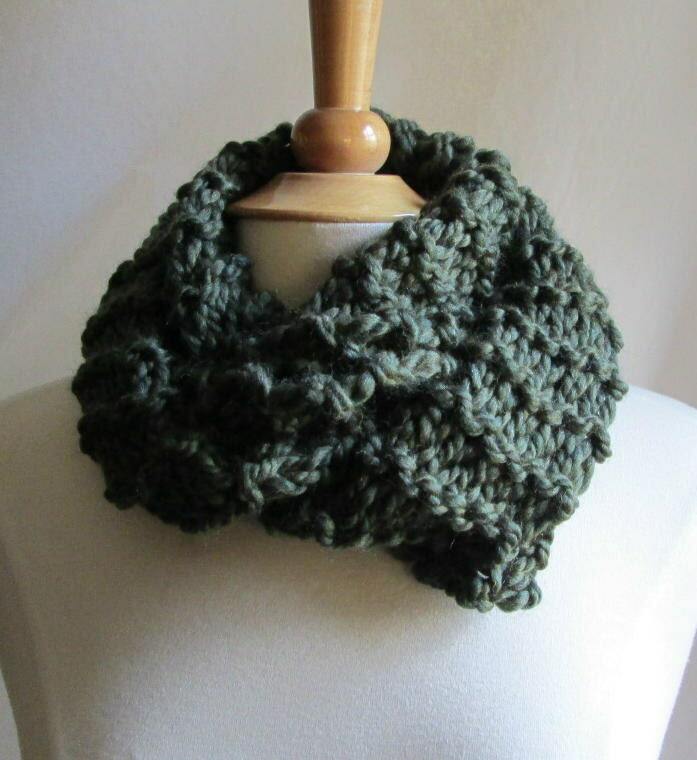 This scarf was knit using a wonderful bulky yarn in a lovely shade of moss green. Super soft and plush, it will keep your neck warm in cold, windy conditions. There's nothing worse than a chilling draft going down your back. Pullover style is designed with a twist - it can lay flat for full neck and throat coverage, can be folded over for a collared look or can be gathered for a looser feel. The size allows it to be unisex in style as well. Yarn is Acrylic Wool blend. About 48" in circumference, 8" wide. Hand Knit in my smoke free home and ready to ship. I bought this as a gift for my friend and she absolutely loves it. We both are Outlander fans and this scarf resembles Claire's so well. She told me its comfy and warm. The shipping was fast and its worth it. Homemade is best! This scarf is thick and chunky and gorgeous. It's softer than I expected it to be given the wool, which I seem to be really sensitive to, and to me there is the slightest scratchiness, but it doesn't bother me, so if you're not sensitive, it shouldn't bother you. I love this and am wearing it happily today! I accept money orders and payment via PayPal. I prefer that items paid for via PayPal ship to a Confirmed Address. Payment within 7 days, please. Returns not accepted. All my scarves are new and unworn. I am more than happy to ship internationally. The postage rates are currently so varied that I no longer include flat rates in my listings. If you are interested in an item, please send me a convo and I will get you the current S&H rate. International buyers - I mark customs forms as merchandise at purchase price. Any customs fees or taxes are the responsibility of the buyer. Any questions about color, content or texture, please send a convo. I'm more than happy to assist in any way that I can. Scarves should be hand washed in cold water, rolled in a towel to remove moisture and then dried flat.